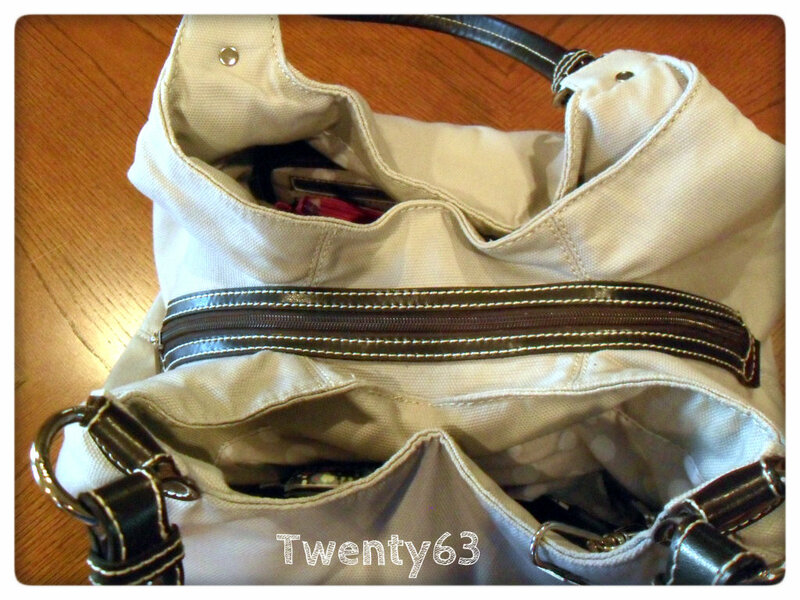 twenty63: What's in your purse? Earlier this year while I was reading one of my favorite blogs called A bowl full of lemons she featured a purse quiz that I have been eager to take ever since. 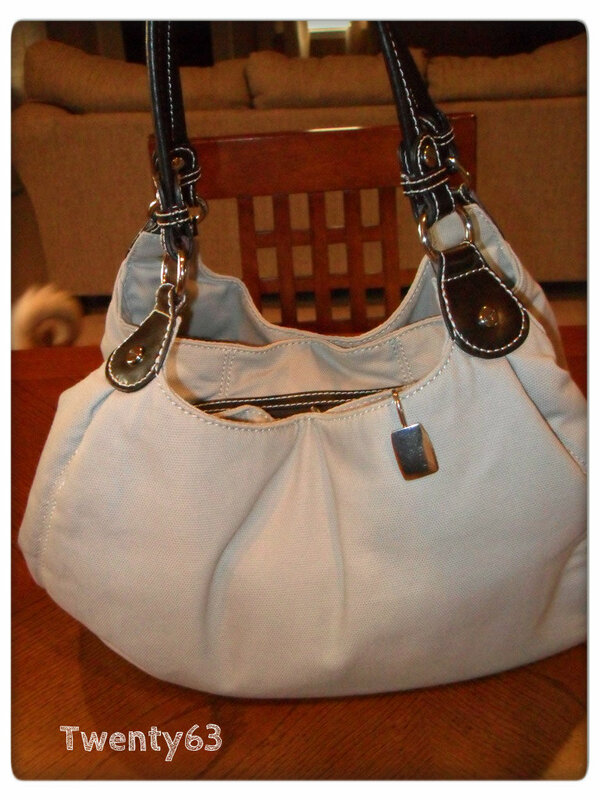 I am not a girly girl, but I LOVE having a nice handbag. 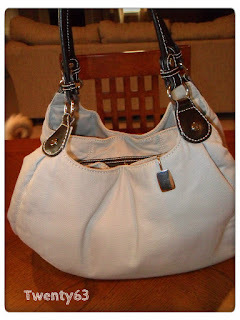 A nice handbag doesn't have to be expensive or name brand all the time, but it has to be functional to your needs. My purse is like my mobil home for real. I never leave the house without it. So, today I finally took the time to hop over to What Does Your Handbag Say About You? Your motto is: "Be prepared." You don't like to be surprised by anything. It's called the 5th Ave bag and I bought it in a neutral taupe color. One thing I love about this bag is all the storage. It has a center pocket that has a zip closure and two large side pockets with magnetic snap closure. One of the side pockets has two smaller pockets inside and the other large side pocket has a zip closure pocket inside. In one side pocket I keep kleenex on the go pack, I have a small key change which holds most of my store reward cards, a mini zipper thirty-one pouch that holds my lip gloss addiction supply and a thirty-one compact mirror along with my thirty one soft wallet. The center pocket holds most of my work related items I need to keep secure like my office keys, bag and creditionals. I also keep a small coupon filer which holds just dinner and retail coupons since they are the only coupons I keep on me all the time and my thirty-one fold-and-go organizer which holds a notepad and my nook. What do you keep in your purse? What does your purse say about you? If you take the quiz, I would love to know the results!! I wish I could only carry a wristlet. I've tried and I think I just carry to much junk with me haha. The only time I don't carry my full purse is when we go to an amusement park or some place with activities and a very large crowd. I wonder what question prompted my "high maintenance" answer haha. haha I wondered that too... you don't seem high maintenance... unless it was the name brand question? ?